The DigiSmart™ Antenna mounts inside the Amana® DigiSmart PTAC, hidden from sight.It is powered through the PTAC and requires no batteries. 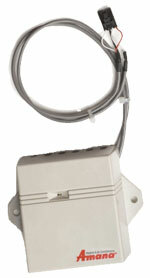 The antenna is required to connect the DigiSuite radio frequency (RF) wireless devices to the Amana DigiSmart PTAC. Some Amana DigiSmart PTACs may require software upgrades to the latest version of DigiSmart controller software to allow RF wireless devices to be linked to the antenna.